In his first four years as president, Abdel-Fattah El Sisi oversaw a constriction of public space and the elimination of any real political opposition from it, but after the National Elections Authority (NEA) announced a timeline for Egypt’s presidential election period, these efforts went into overdrive. As our previous brief documented, a variety of repressive measures were used to during this period. A single candidate—Moussa Mustafa Moussa—registered at the eleventh hour to save the appearance of choice. Thus, just as the controlled manner of the “elections” renders them meaningless as an expression of choice for a particular candidate, the campaign period itself was that in name only. Rather than present a vision for Egypt’s next four years to convince an electorate of his worthiness to govern, Sisi eschewed any real policy platform in favor of mobilizing sentiments of both fear and patriotism to ensure that citizens participate in the vote. For his part, Moussa, who registered as the only contender to Sisi, made clear in every appearance that he was perfectly content with his opponent’s success. All the while, the repression of any criticism of or alternative perspectives about Egypt’s current state of affairs escalated even from the fervent scale of the previous months. 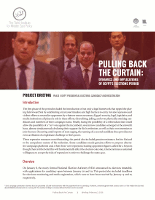 This second briefing in our series “Pulling Back the Curtain: Dynamics and Implications of Egypt’s Elections Period” highlights developments and dynamics during this period. Moussa held multiple public interviews leading up to the election, though he did not organize large summits or events. He reiterated on multiple occasions that he generally supports Sisi’s policies and seeks to expand upon them, though he frequently asserted that he was a genuine candidate who legitimately aspired to become president. Moussa’s support was mostly limited to members of his own party, the Ghad Party; at one rally the crowd reportedly chanted, “Whether Moussa wins or Sisi wins, either is our president!” None of the 27 representatives who officially endorsed Moussa publicly expressed their support for him during this period. Space for political discussion restricted to the point that even pro-regime figures faced sanction for failing to adhere strictly to state doctrine. In addition to the crackdown on the media’s operations, civil society representatives, human rights activists, and journalists faced increased harassment, with little clarity on red lines. Moataz Wadnan, a journalist who conducted an interview with Hisham Geneina in early February, was arrested on February 23. His family, along with the families of fellow jailed journalists Hassan al-Banna and Mustafa al-Aasar, have lodged complaints over the lack of information concerning their whereabouts. Similarly, lawyer Ezzat Ghoneim of the Egyptian Coordination for Rights and Freedoms disappeared after reporting on subsequent arrests of individuals mentioned in BBC’s report on forced disappeances. Even pro-state TV host Khairy Ramadan was detained by security forces for “defaming police” after discussing low police wages on his program. This period witnessed a troubling crackdown on political opposition, whereby any efforts not in direct support of Sisi were deemed unpatriotic. Members of a boycott movement, led by a group of prominent political figures called the Civil Democratic Movement (for more, see the Phase I briefing), were derided from all sides of the political establishment. Sisi referred to the movement as an attempt to revert Egypt to revolutionary chaos, while Moussa’s supporters chanted at a rally that boycotters are “traitors and cowards.” The Coalition in Support of Egypt, the largest parliamentary bloc, decried the boycott as a “betrayal of the homeland.” Other prominent representatives criticized the boycott movement, even requesting that Ali Abdel ‘Al, speaker of the House of Representatives, expedite amendments to the Penal Code to allow for the imprisonment of boycotters. Alongside criticism of the boycott movement as a whole, specific members of the political opposition were targeted for arrest, and several face serious charges. Strong Egypt Party President Abdel Moneim Abul Fotouh was jailed for alleged connections to the Muslim Brotherhood just days after he appeared in an interview with Al Jazeera, during which he commented on the poor state of Egypt’s opposition and criticized counter-terror operations in Sinai. Fifteen other members of his party, including Deputy President Muhammad al-Qassas and al-Wasat Party Secretary-General Muhammad Abdel Latif Talaat, were arrested on charges of “spreading false news” and “inciting chaos.” Abul Fotouh was subsequently added to Egypt’s terrorism list. Hisham Geneina, the former head of the Administrative Control Authority and a member of former presidential hopeful Sami Anan’s campaign team, was arrested for statements he made asserting that Anan possessed sensitive documents implicating senior officials in violent crimes following the 2011 revolution. Anan, who was held in detention since late January for expressing political ambitions while being an enlisted member of the military, denied these allegations. Hassan Hussein, a member of the Kefaya Movement and the Karama Party, and Gamal Abdel Fattah, a prominent political activist, were arrested in early March, and both have been accused of belonging to terrorist organizations and disseminating false information. Civil society, both at home and abroad, were united in their criticism of the repressive environment in which the elections were to be held. Fourteen local and international nongovernmental organizations denounced the “farcical” nature of the election following the imprisonment or coerced withdrawal of all of Sisi’s opponents except Moussa. Government officials claimed that these organizations reported inaccurate details in an attempt to defame the state, and several, including Human Rights Watch and the Egyptian Initiative for Personal Rights, were later accused by members of the House of Representatives of accepting funds from international governments in exchange for reporting false information ahead of the election. Media presented similar disinformation, and TIMEP’s own work was referenced as such in a January report from al-Youm al Sabaa and again in a March TV segment from host Tamer Moneim. The ongoing crackdown on media (which usually focused on private domestic outlets, independent journalists, and Al Jazeera) reached prominent international outlets in this period. Several media outlets, including BBC and the New York Times, released reports detailing human rights abuses and joint military operations with Israel under Sisi’s presidency. Many government officials interpreted these articles as attacks on the country in light of the election: Representatives in parliament and Egypt’s State Information Service decried them as attempts to defame the nation ahead of the election, and some officials called for media censorship to prevent the dissemination of false information. These outcries reached a fever pitch following the BBC’s “The Shadow over Egypt” report on forced disappearances in Egypt under Sisi, and resulted in an ongoing legal battle to end the outlet’s operations in Egypt. Furthermore, British journalist Bel Trew of the Times of London was expelled from the country with little explanation. Egypt’s military launched Operation Sinai 2018, Egypt’s largest military offensive to date in its war on terror, during the election’s campaign period, with Sisi making appearances in North Sinai dressed in military fatigues. The operation—the objectives of which are to eradicate terrorism in the country and to disrupt finance networks by shutting down trafficking routes—has thus far seen the deaths of 151 individuals and the arrest of 3,177, according to statements from the armed forces. The campaign has also raised serious concerns for the situation in the country, as it has effectively laid seige to parts of Egypt, preventing the supply of food, medicine, and other essential goods, risking a humanitarian crisis. The U.S. government delivered inconsistent messages, emphasizing support for Egypt and the strength of bilateral relations, while also urging free and fair elections and tepidly criticizing the current environment. During a visit to Egypt in January, Vice-President Mike Pence praised Egypt-U.S. relations, saying that “ties have never been stronger.” Secretary of State Rex Tillerson struck a similar tone, and though he called for transparent elections during a February visit, he failed to comment on the repressive environment. Weeks later, State Department spokeswoman Heather Nauert tweeted concern over the detention of two journalists and described freedom of expression as a “fundamental pillar for any democratic society.” Nauert had already expressed concern over the arrest of Sami Anan and the need to address “restrictions on freedom of association, peaceful assembly, and also expression.” Senator John McCain (R-AZ) strongly criticized the closure of public space in a late January statement; on March 22, Congress passed the fiscal year 2018 omnibus package, appropriating the standard $1.3 billion in foreign military financing and $112.5 million in economic support funds to Egypt with conditions similar to those set in previous years. European officials were notably silent during this phase. In mid-February, the European Parliament adopted a resolution condemning the use of the death penalty in Egypt; however, member states and Egypt continued to conduct business as usual during this time period. French and Egyptian naval forces took part in a joint military exercise titled Cleopatra 2018, indicating the continuation of the two countries’ strong military partnership; a report by the Stockholm International Peace Research Institute designated France as the largest provider of weapons to Egypt in 2017. Every effort was made to promote Egypt’s regional role with highly publicized delegation visits. Saudi Crown Prince Muhammad bin Salman visited Egypt in early March; discussions focused on economic relations between the two countries, culminating in the signing of a $16 billion Saudi investment in various development projects in Egypt. Sudanese President Omar al-Bashir’s mid-March visit featured an open endorsement of Sisi’s reelection, as he stated that Sisi’s continued leadership will prove instrumental in developing an amenable resolution to the ongoing tensions over the Grand Ethiopian Renaissance Dam. Egypt also continued efforts to position itself as a major partner in the ongoing discussions between Israel and Palestine and to host meetings aimed at consolidating the Libyan military.